← Further Questions: What value do you place on references? I’d like to see a Skills sections up top instead of jumping right into experience. Maybe a Notable Achievements section too so I don’t have to dig through the day-to-days of your previous positions’ duties to find the cool stuff. And speaking of digging to find cool stuff, you did vocational study in Japan! You’ve got to mention the skills and experiences you picked up there more prominently. That’s a selling point! The way your resume is structured now, the first thing I notice is that your education was a while ago and the second is how brief your latest job was. (If it is on-going you should say 8/14 – present. If it was a term position, you should note that to forestall questions.) Moving those down will put focus on your abilities instead. Create a professional header for your name and contact information (include your social media accounts). 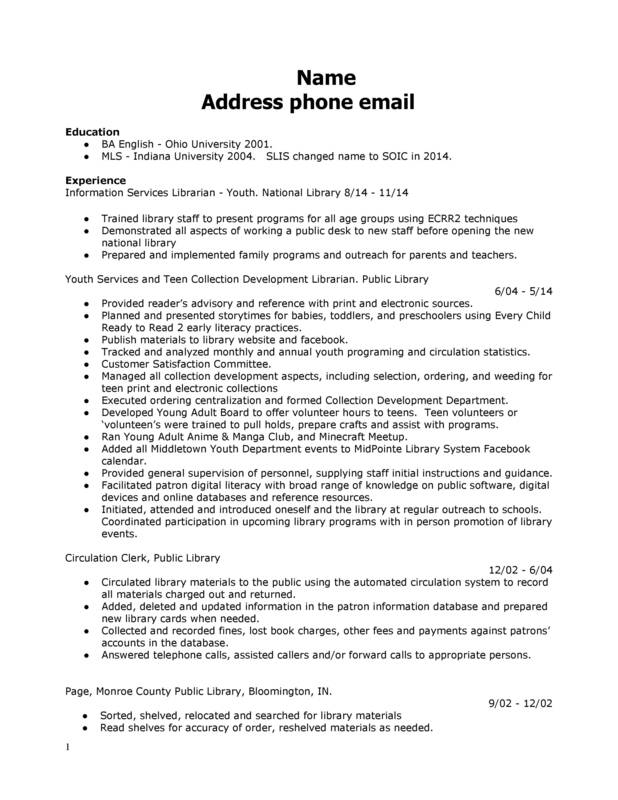 Add a succinct career profile section to the top of your resume that sums up your computer/database/integrated library system(s)/languages/social media/youth services skills. Tailor this area for each job application. Move your education to the end of your resume and bold your job descriptions. Some of your job duties need to be flushed out. What materials did you publish to the library website and facebook and did you establish/chair the “Customer Satisfaction Committee”? 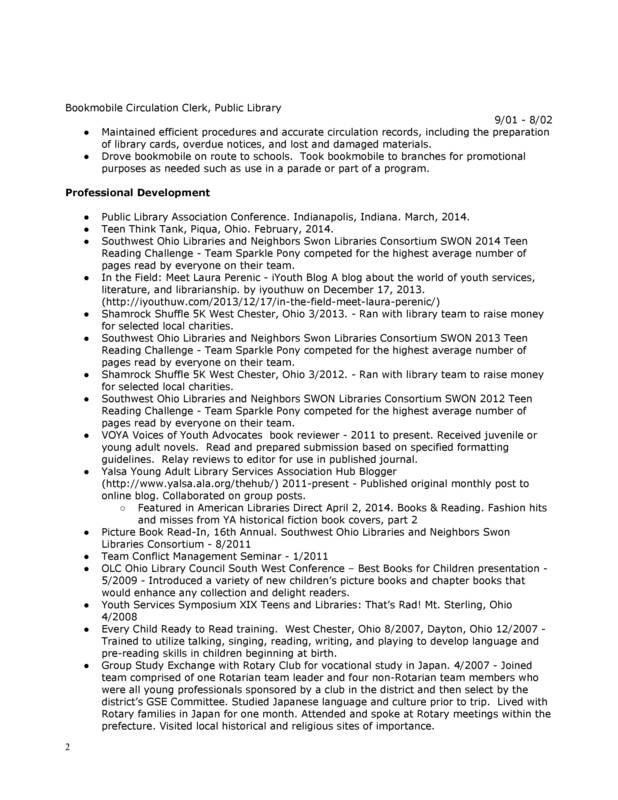 The Professional Development area of your resume is very dense. Try reworking this area by grouping similar PD activities under subheadings. I echo the comment above on your most recent position. If you were brought in as a consultant, indicate that as it speaks to your expertise. Consider spelling out EECR2, unless this is so well-know in the public library world that anyone reviewing your resume will know it. In general, add some numbers to your experience bullet points: how many employees did you train? how many programs did you implement? There are too so many bullet points, it’s hard to find the good stuff. You could consolidate/eliminate some of these–you have two points about adding information to social media accounts, as an example. You could also divide this section into sub-headers–collection development, promotion/outreach, literacy, etc..which will make it easier for a potential employer to understand quickly what you did. As someone who reviews resumes for open jobs several times a year I can say that we get so many applicants, your resume needs to make it quickly obvious that you have the skills for the position. Some of your accomplishments are impressive, so make them stand out–you formed a collection development department and created a young adult board–highlight those. Circulation clerk position: You could tighten this up, too. You don’t need to explain what circulation is as in your first bullet and could combine this information. This section is so long, the good stuff doesn’t stand out. You’ve got good stuff in here–Japan as noted above, and VOYA book reviewer, mixed in with a charity run,conferences you attended, and job responsibilities. If you didn’t present at a conference, or lead a round table, etc… then don’t list it under professional development–save this section for the more substantial activities. Consolidate–you don’t need two entries for Teen Reading Challenge–list it once, with both years. And, consider if that is professional development, or does it belong with your position bullet points? Keep professional development for training activities. Overall, I think that in putting together this resume, you have done a good job in rounding up everything you have done. Now you need to organize it in a way that makes your biggest accomplishments stand out, and be a bit more selective in what you include. This feels very cluttered. I don’t know, as a reader, what I am supposed to be focusing on. I would echo the advice above about adding some sort of header with contact information. I wouldn’t center it… but that’s purely a personal thing. Since you got your MLIS ten years ago, it’s no longer the most important thing on your resume, I would move it down under experience. The professional development section is really difficult to follow. I can’t tell what I am supposed to be focusing on. It might not be needed to “explain” what each conference was underneath the conference. I agree your study work in Japan is really cool and should be highlighted somehow… perhaps adding it to the education section? Lastly, I would consider spacing issues. This feels very dense and your third page only has one paragraph on it. Either make the resume 2 pages, or make the third page work for you. You have ten years of experience, it’s okay if your resume is a little longer, I think. Agree with several others. This resume seems very long. Professional development section is unnecessary and bullets of the job you had for 10 years needs to be drastically reduced. Obviously, you need to rewrite your resume for each position. Many times you can highlight the specific strengths that the employer wants for each job listed in your resume. Last, if you want to be a team lead or department head, I would need to see a lot more experience in supervising, budgeting, planning, coordinating, training, etc. You may have that kind of experience but I wouldn’t assume that based on this resume. Show me that you have leadership skills. I have some questions about how to show experience I cannot quantify. How do I prove I supervised people or that I coordinated with schools for outreach?